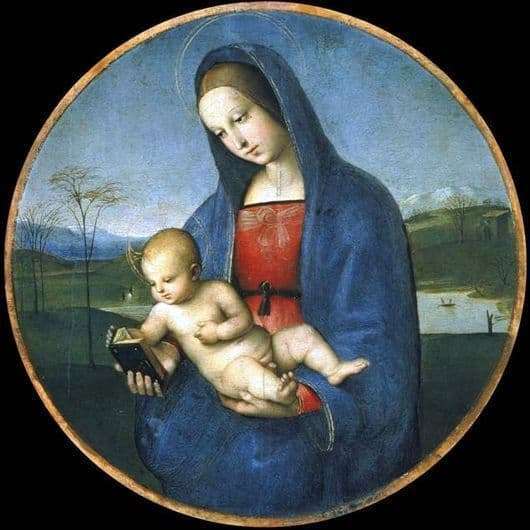 When Santi wrote Madonna and Child, he was almost seventeen years old. Therefore, in this picture there is still no that classical beauty, that brilliance and pictorial execution, which the later works of the master were famous for. But in the chamber and modest “Madonna and Child” there are other qualities that give her an exquisite look. The main feature of the picture is the subtle lyricism that permeates the whole picture. He is seen as in the image of the Madonna – very young and, as a child, naive features of the girl. And also in the virgin landscape, which is spread out gently behind her. Spring mood reigns in everything, everything becomes green and buds bloom as signs of a new life. The main feature of the Madonna is her thoughtful clarity of features; the same mood soars around her. By the nature of the chamber, this picture resembles a miniature for book publications. Having chosen the circle as a form of his work, Raphael naturally builds a composition in a limited space. The girl fits into this framework very harmoniously. The rounded shape of which perfectly emphasizes the smoothness of Madonna’s shoulder lines, the head covered with a veil, the lines of the second shoulder. The figure of the girl is located strictly in the center. The body of the child is located under the same bias as the mother’s head. Thanks to this technique, the artist managed to harmoniously combine these two persons into a single composition. The child is trying to play, but his mother is keen on reading, which also interested the baby, so they both turned towards the book. It creates the impression of perfect peace and tranquility. It should also be noted that the frame of the picture is also made according to the drawing of the artist himself. These are grotesque ornaments, black and gold colors are combined. Gilded frame, made in low relief with carving on wood.